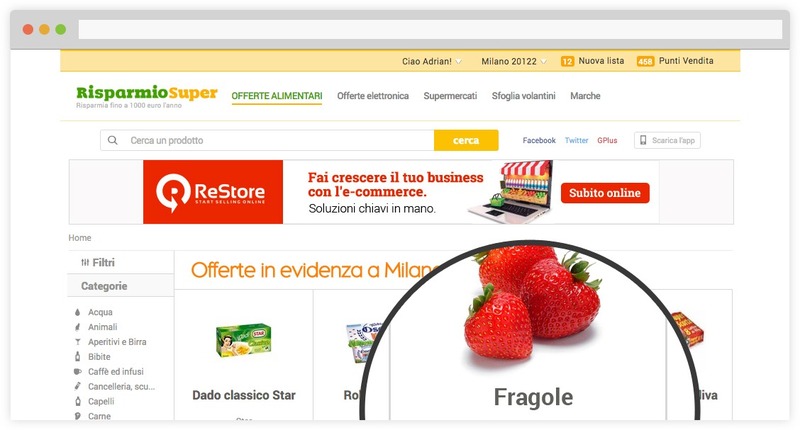 In 2011 we launched the first italian comparison website for grocery store prices (www.risparmiosuper.it), helping consumer save time and money and retailers and brands check their competitors prices and shoppers behaviors. We leveraged this experience made in the b2c field pushing grocery retailers toward the online e-commerce venture. We can proudly be considered among the first pioneers in this field. A team of senior professionals in the Marketing, Cloud and scalable IT architectures, UX and business experts, that provide every day advanced consulting in one of the most promising fast growing market. We are pioneers on e-commerce for retailers in Italy, with a team of Marketing, Information Technology, Cloud and User Experience. We believe on fast growing retail e-commerce market potential.